Section 3679(c) of title 38, United States Code requires VA to disapprove programs of education for payment of benefits under the Post-9/11 GI Bill and Montgomery GI Bill-Active Duty at public Institutions of Higher Learning (IHLs) if the school charges qualifying Veterans and dependents tuition and fees in excess of the rate for resident students for terms that began after July 1, 2017. A Veteran who lives in the state where the IHL is located (regardless of his/her formal state of residence) and enrolls in the school within three years of discharge from a period of active duty service of 90 days or more. An individual using transferred benefits who lives in the state where the IHL is located (regardless of his/her formal state of residence) and enrolls in the school within three years of the transferor’s discharge from a period of active duty service of 90 days or more. Anyone using transferred Post-9/11 GI Bill benefits who lives in the state where the IHL is located and the transferor is a member of the uniformed service who is serving on active duty. Anyone using benefits under the Marine Gunnery Sergeant John David Fry Scholarship who lives in the state where the IHL is located (regardless of his/her formal state of residence). The in-state tuition provisions do not apply to those individuals on active duty using benefits under the Post-9/11 GI Bill and Montgomery GI Bill-Active Duty. 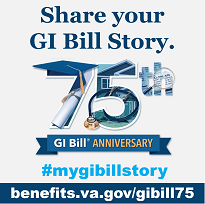 Public IHLs must offer in-state tuition and fees to all covered individuals with Post-9/11 GI Bill and Montgomery GI Bill - Active Duty (MGIB - AD) benefits in order for programs to remain approved for GI Bill benefits for terms that began after July 1, 2017. After July 1, 2017, VA will not issue payments for any students eligible for the Post-9/11 GI Bill or the MGIB-AD until the school becomes fully compliant. These requirements ensure our nation’s recently discharged Veterans, and their eligible family members, will not bear the cost of out-of-state charges while using their well-deserved education benefits. Am I eligible for the resident rate for tuition and fees? By law, schools are allowed to have additional requirements that must be met in order for a “covered individual” to be charged the resident rate for tuition and fees. Therefore, you should contact your school to learn more about their rules and requirements for charging tuition and fees. Your school will review your particular situation and determine if you will be charged the resident rate. You may access the contact information for your school and search by state or territory. If, after discussing this matter with your school, you believe the school incorrectly intends to charge or has charged you more than the resident rate, you should submit a complaint into the GI Bill Feedback System. Please include details as to why you believe either you or your beneficiary has been incorrectly charged out of state tuition. Our Complaint Team will review the case and take appropriate action.